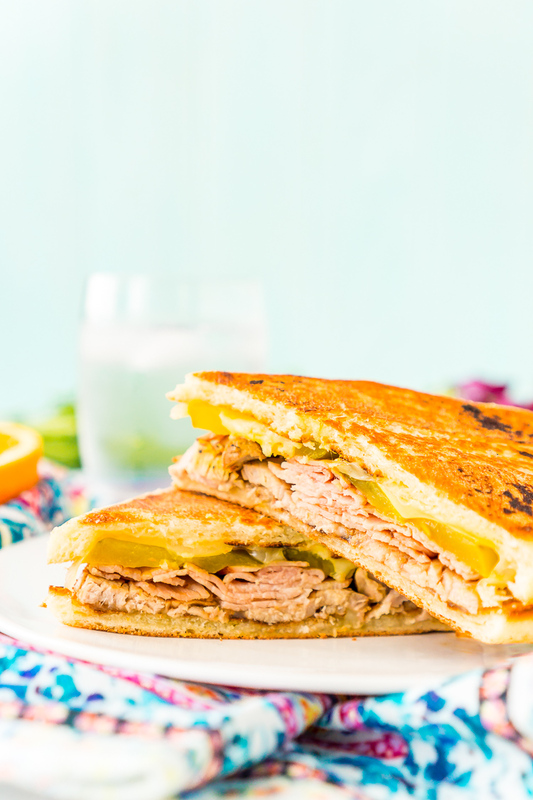 This Cuban Sandwich is loaded with smoked ham, swiss cheese, mojo pork, mustard, and pickles, and then grilled to melty perfection! 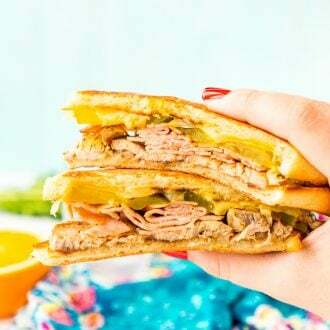 I’m excited McKenzie Natural Artisan Deli is sponsoring today’s post so I can share this super tasty Cuban Sandwich Recipe with all of you! All opinions are 100% my own. About three times a year I decide that need to make a Cuban Sandwich, and I blame Jon Favreau. I have a handful of what I call background noise movies and Chef is one of them. It hits a lot of buttons for me on a Saturday morning, it spends a lot of camera time focusing on melting cheese and cooking meat, and it has an underlying theme that makes me feel like it would be ok if my career went belly up in my forties. Invetiably though I get to point in this movie where this sandwich gets made and I think “I could do that” and from there, my Saturday is shot. This is a no joke sandwich if you’re going get serious about it. But after a couple of years of trying this, I’ve come up with a way that gets you 90% of the way there without causing you to buy enough ham to feed an army, bake loaves of bread from scratch, or invest a couple grand in industrial kitchen equipment. JUST TAKE ME TO THE CUBAN SANDWICH RECIPE ALREADY! 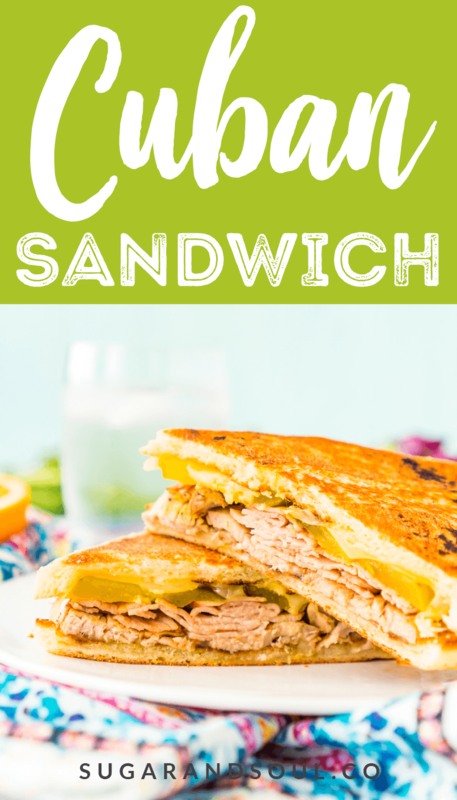 If you’d rather skip my (very helpful, I think) tips and tricks, essential cooking info, and similar recipe ideas – and get straight to this deliciously easy Best Ever CUBAN SANDWICH Recipe – simply scroll to the bottom of the page where you can find the printable recipe card. At its core, a Cuban Sandwich is a grilled ham and cheese, but it’s the Cadillac of ham and cheeses. 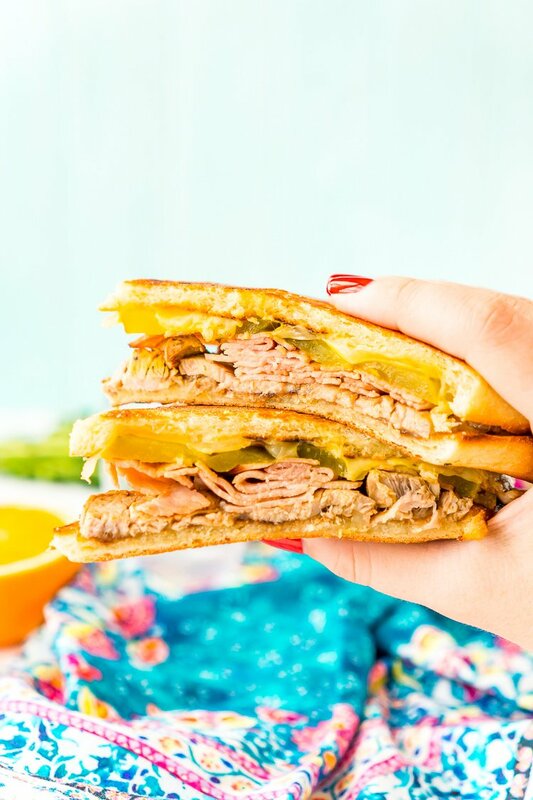 In order to get away with calling it a Cuban sandwich (or a Cubano), you need a handful of ingredients, smoked ham, mojo pork, swiss cheese, mustard, and pickle, AND you’ve got to grill it. 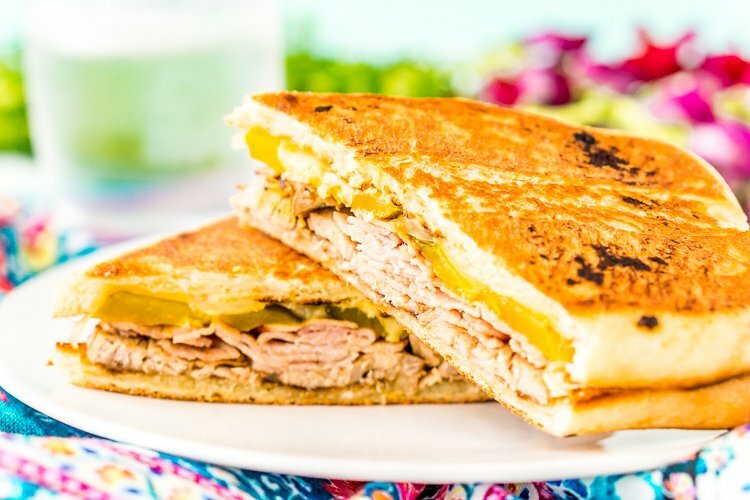 What kind of bread do you use for a Cuban sandwich? So if you’re going to be a purist there is actually a Cuban bread that is perfect for these sandwiches. The only problem is it can be tough to find if you’re not in a metropolitan area, and I’m not about to start baking bread that just adds a couple more hours between the me that exists now and the future me that has eaten this Cuban sandwich. Whenever I decide that a Cuban Sandwich is a must for the weekend menu, I head straight to Shaw’s for my ingredients. The first stop of which is to the deli where I can pick up my favorite McKenzie Natural Artisan Deli Naturally Smoke Uncured Ham and Swiss Cheese. McKenzie Natural Artisan Deli is based out of Vermont and their meats are only made with high-quality whole muscle meat and never contain hormones or antibiotics. It’s hands-down the best deli meat around! Next up, it’s time to grab my ingredients for the Mojo Pork, as well as the mustard, pickles, and bread. Then it’s time to get home and get to work! Instead of investing in a plancha (or panini maker) if you don’t already have one, use two cast iron frying pans, one slightly larger than the other. I heat both up on the stove, place the Cuban sandwich in the big one then put the other on top, press down a bit and let them sit there. This method requires some oven mitts but it’ll save you some money and valuable cupboard space. Seriously, use oven mitts. Don’t be a hero. 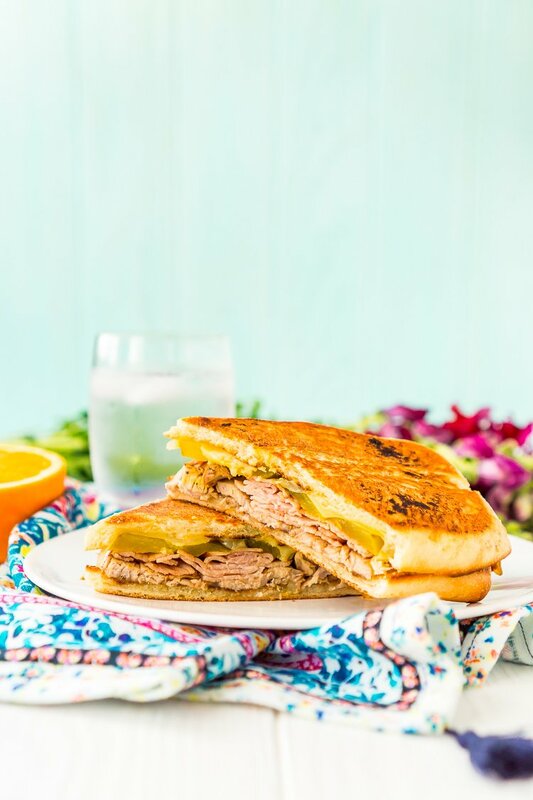 Pin this Cuban Sandwich Recipe for Later! Preheat two cast iron skillets* or a panini maker. Once the sandwich is assembled, butter outside of both pieces of bread and place in the skillet. Place the smaller skillet on top of the Cuban sandwich letting the weight compress it. Use oven mitts so don't burn yourself. Cook until warmed through and golden brown on the outside. You may need to flip once to ensure even cook. If you have access to Cuban Bread, then French bread or a soft ciabatta will do or even a hoagie roll. You're looking for a bread that is about 3 inches wide, soft on the inside and crusty on the outside or one that can be toasted up nicely for a crunchy outer layer. Instead of investing in a plancha (or panini maker) if you don't already have one, use two cast iron frying pans, one slightly larger than the other.